Breaking News in Providence, R.I.: Conference Discusses Future of the Liturgy in the Catholic Church. Leading Catholic clergy and lay people will address New England Catholics in Providence, R.I. this month at a conference on the issue of liturgical reform under the new Pope, Benedict XVI. Recent rumors from the Vatican indicate a significant document on these issues will be presented soon, and this document will have serious implications for the future of the liturgy in the Church. Providence, R.I. may be aptly named for traditional Catholics this month, as the head of the world's oldest organization dedicated to the preservation of the Latin Mass - and the head of the world's only Vatican-approved diocese devoted exclusively to the Latin Mass - will together address interested Catholics on the future of the liturgy. Catholics from all over New England and as far away as Brazil will assemble in Providence on November 18-20th for a conference entitled "Tradition in the 21st Century: The mission of Una Voce in the papacy of Benedict XVI." The conference is sponsored by Una Voce, an organization originally founded in Europe in the 1960s that is dedicated to the support of the Latin Mass, which once held sway throughout the Catholic world. Guest of honor for the conference is Bishop Fernando Rifan, head of the Campos, Brazil diocese devoted exclusively to the liturgical books of 1962. Other speakers include Msgr. Michael Schmitz of the Institute of Christ the King (an order of priests entirely devoted to the old rite), Fr. Joseph Wilson, Fr. Thomas Kocik, and newly elected president of Una Voce International (FIUV), Fra Fredrick Crichton-Stuart of Scotland. Complete information on the event can be found on the web at http://www.uvaconference.blogspot.com. Rumors have abounded in the press recently that the Vatican's theologians, canonists and liturgists are currently studying the whole question of the Roman Catholic liturgy and what needs to be done to "reform the reform," a phrase that refers to the reforms of the liturgy undertaken in the wake of the Vatican II council in the 1960s. These reforms included changing the prayers of the Mass, presenting it entirely in the vernacular, and moving the altar between the priest and the people, thereby changing the orientation of the ritual. Msgr. Camille Perl of the Ecclesia Dei Commission (created by Pope John Paul II to deal with matters related to the traditional Latin Mass) was present at the General Assembly meeting for FIUV this October in Rome. In his presentation to the assembly, he noted "They are preparing some important things in this field [of liturgical reform]," which would imply that a document to this effect is in preparation. "We have had a new Pope already five or six months and I must say, there has been a change in the atmosphere. There is a new spotlight focusing on us," Perl pointed out. All of this is bodes well for those Catholics already devoted to the traditional Latin Mass, but also for those who see a real need for liturgical reform of the vernacular Mass in the Church. "A papal policy that favors the traditional Latin Mass is one that will also look to correct the liberties taken with the current rite and bring it in line with the original intentions of the Vatican II council," commented Indira Sweeny, a director of the American Una Voce association. "Many Catholics are seeking genuine liturgical reform and place their hopes in the new Pope, who as a cardinal has written much on these issues. These are interesting times for the Catholic Church and the Providence Una Voce conference will provide a timely forum for discussion as the Church awaits the presentation of the rumored Vatican document," Sweeny said. 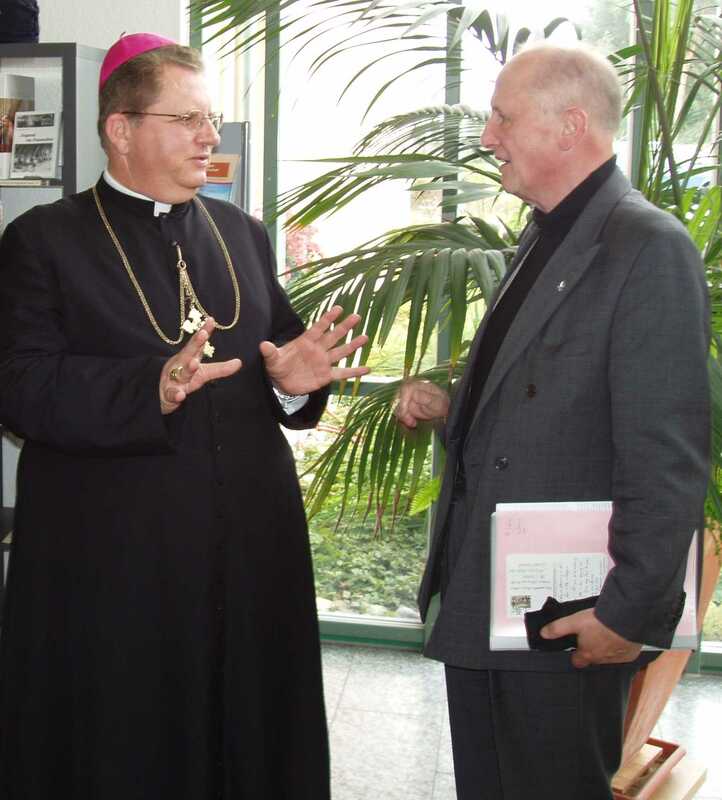 Bishop Rifan and Fra Freddy Crichton-Stuart, August 2005Bp. Rifan and Fra Freddy at Juventutem, World Youth Day 2005. Juventutem was the offical contingent to WYD representing youth devoted to the old rite of the Mass.